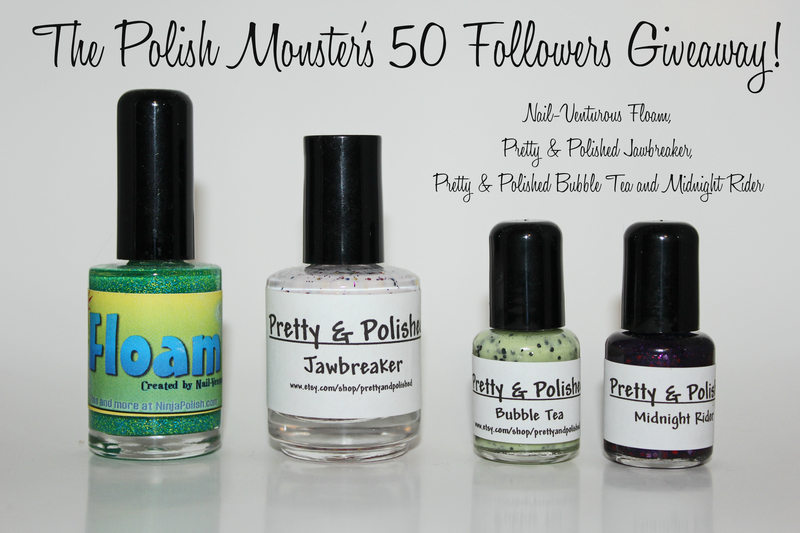 Polish Monster’s Very First Giveaway! So as many of you may have noticed, my followers on Facebook have seemed to jump rather quickly the past few days. On Friday night I was quite proud of my 22 followers- I had only started blogging 2 weeks earlier and was chugging right along- and thanks to a few sweet friends sharing my page info, I quickly jumped to 48 followers only 24 hours later. Now I’m already up to over 70! Truly, you guys are all amazing. I’ve been looking forward to giveaways because I love giving people presents 🙂 I really wish I could give everyone something, but since I can’t, I will try to spread the wealth around a little- so this giveaway will have 3 winners. Would you like to see what I have up for grabs this time around? Here we go! 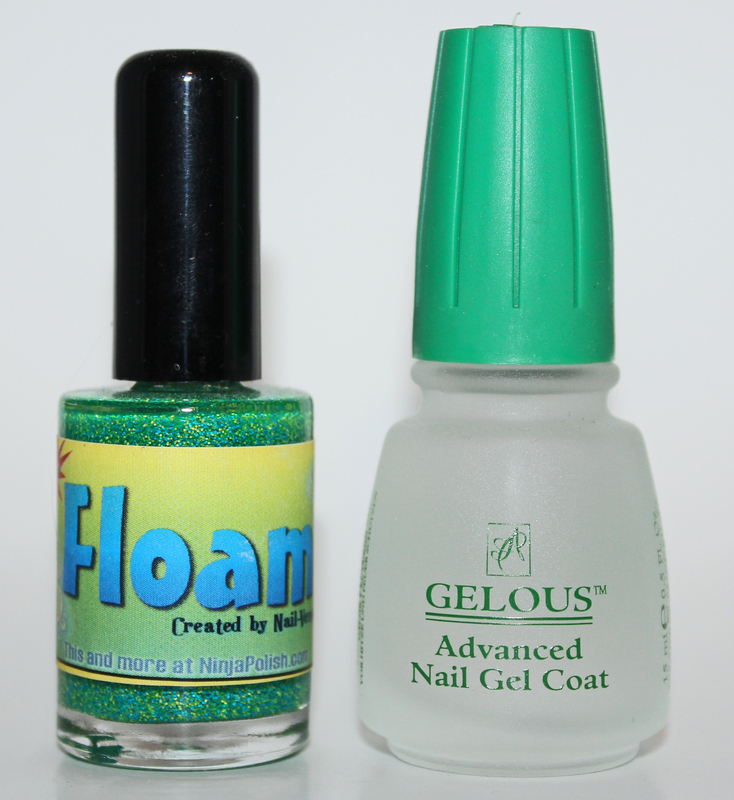 Prize #1 : Floam by Nail- Venturous Nail Lacquers and Gelous Advanced Nail Coat! 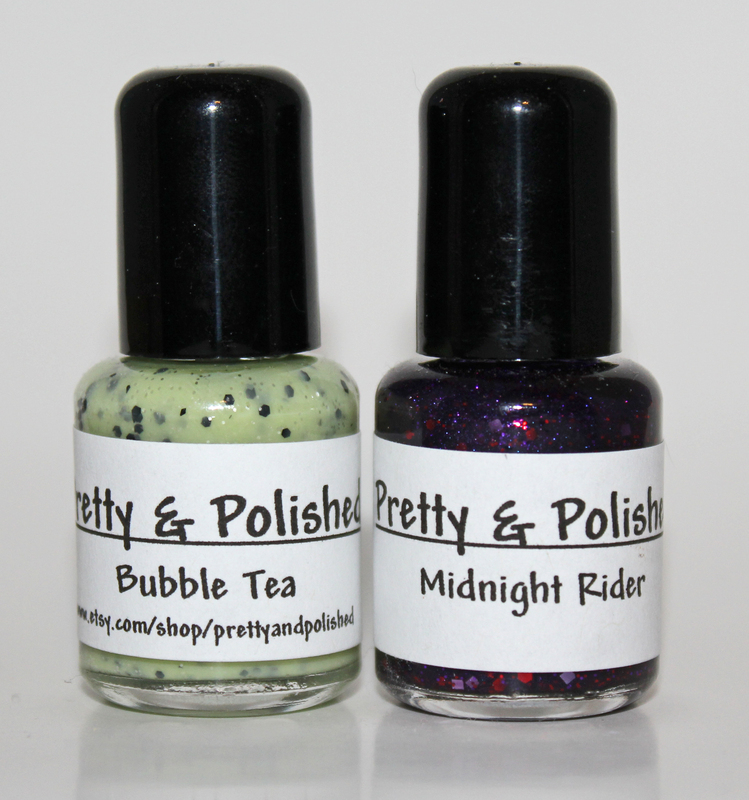 Prize #3: Pretty and Polished minis of Bubble Tea and Midnight Rider! I had great plans of having swatches of these polishes before I posted this giveaway, but you all have surprised me and forced me to move faster! 🙂 Luckily there’s a lot of amazing blog posts out there highlighting each one up for grabs. Check out Amy from I’m Feeling Nailventurous’ post on her very own Floam and her review of Jawbreaker. Sarah from Chalkboard Nails has some beautiful swatches of both Bubble Tea and Midnight Rider. So here’s the details: Since apparently WordPress and Rafflecopter don’t like each other, I’ll be doing this the old fashioned way- comments and random.org. You can enter up to 2 times only. 1st Entry, mandatory– Comment here, to THIS post, explaining how you follow Polish Monster. I don’t care how you follow- email, RSS, Facebook- but you need to follow in some form or fashion. I will be double checking these, so please include the name you follow under. IF you have a prize preference- please list it here as well. (If you already own one of the prizes, etc). I’ll do the best I can! 2nd Entry, optional– Share the giveaway. You can do this via a blog post or Facebook. If you choose Facebook, please ensure it’s a PUBLIC post so that I can see it. Leave a SECOND COMMENT on this post with a link to where you shared the giveaway. I will say this once- I’m not going to babysit these entries. If you don’t follow the directions I’m very sorry, but I’m not going to contact you to let you know (If *you* realize you messed something up though, please just email me or contact me and we’ll figure it out). You can only enter up to twice- as listed above- per person. It does not matter how many times you share this post, you only get 1 entry for sharing, though of course I appreciate the enthusiasm 🙂 I’m going to be checking everything and will throw out extra entries- so pretty please follow the rules. I will close down comments on Saturday, July 7th at 11:59 pm CST. I *hope* to have the 3 winners chosen by Sunday! I will list them here and on Facebook, and winners have 24 hours to contact me via email with their information. If I don’t hear from a winner, I will choose another. So please be prepared to check on Sunday! If that is a problem (out of town, etc), please email or PM me beforehand. Good luck! And thank you for all of your support! This entry was posted on July 1, 2012 by The Polish Monster. It was filed under Uncategorized . Sweet giveaway, Diana! I’d looooove to have Floam. I keep missing it on Ninja, and now that Amy’s not selling anymore, I don’t think I’ll be able to get my hands on *any* NVL! I follow you on Facebook: Julie Bennett, Twitter: @blueeyedlawyer, and through email from wordpress. 😉 Thanks for doing this! It’s an awesome giveaway! I follow you through Pinterest and Facebook, facebook.com/ashley.pashley3. My preference is the amazing Jawbreaker. And i did share your girveaway in facebook, here’s the link http://www.facebook.com/?ref=tn_tnmn#!/theclockwise.nailpolish/posts/320438161381961. http://www.facebook.com/agevey ~Sharing one more time just in case I didn’t do it right the first time, and I still don’t honestly know if I’ve left the right link. I just know I have indeed shared publicly. (prize pref. floam/gel) To be honest, I follow lots of nail pages via fb, but Polish Monster was the very first one I choose to follow! Such a catchy name that I couldn’t resist lol!! Aww thanks! I’m pretty sure I marked you down the other day as a share entry, but I’ll double check and make sure- if not I’ll add it in! I follow you on facebook, twitter, and via email. I love all the prizes, and would be happy with any of them, but I think the jawbreaker might just be my fave. and id prefer prize 2then 3, i own floam! Alrighty ya’ll, on my clock it is now midnight, so the contest is over! Any entries after this comment will no longer be considered!